The open design of this cut out 1/10 carat diamond 14K white gold heart ring from Apples of Gold Jewelry will have you feeling blissfully in love with a stunning design! A simple 14K white gold band comes around to feature a beautiful cut out heart on top, which is fastened to the band and is covered with small diamonds, which total 1/10 carat total weight. The 0.10 carat diamond ring is perfect for a variety of occasions, including a special ring for anniversaries, holidays, or even as a twist on the traditional engagement ring. The diamonds on the ring are rated G-H for color and I1 for clarity. 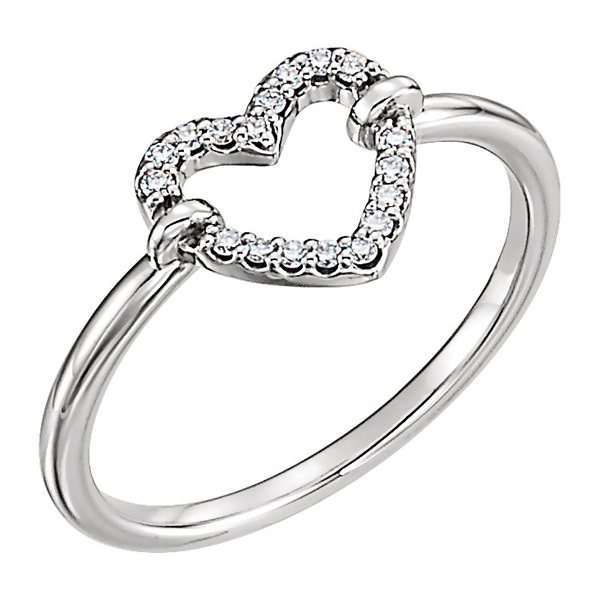 We guarantee our 1/10 Carat Diamond 14K White Gold Heart Ring to be high quality, authentic jewelry, as described above.